Pro-level build, sound and performance with colossal volume. Probably overkill for 'normal' electro-acoustists! Excellent tones. Sonic integrity at huge volumes. Refined onboard effects. Lacks a little EQ tweakability. We've said it before and we'll say it again: for many acoustic guitar players, a dedicated acoustic amp is nestling down there near the bottom of the essentials list: after all, why wouldn't you just plug into the PA? Well, Germany's AER has a fairly compelling answer, as it turns out, wrapped up in the formidable new MM200 Monte Montgomery signature amp. It's a physically big amp, but only 15kg, a surprise when you find out it has two eight-inch speakers powered by two 100-watt transistor power amplifiers. It has neither a pole mount nor tilting option, but we know from years of experience with AER that it is built like the proverbial tank: totally roadworthy, yet still extremely classy in the looks department. It also has an included padded slip cover. 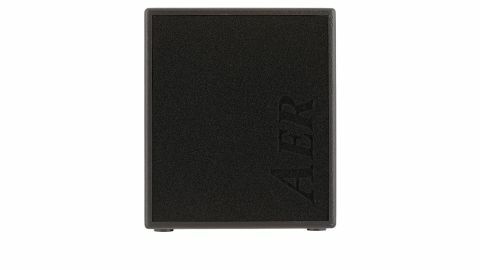 "The MM200 has no parametric mid option, but it's testament to AER's design that we rarely find a need for it"
The amp offers two independent channels and each has slightly different features - anyone familiar with the popular Compact 60 3 will recognise it immediately - and only channel two has an XLR option. In fact, checking the detailed spec of the MM200 against its little brother reveals that the only obvious circuit differences are at the input stage; minor differences in sensitivity and impedance, but it's otherwise the same as the Compact 60 3, including all the controls, EQ values and so on. One important thing to note is that channel one has optional 9V phantom power that can power certain guitar electronics, those able to accept power on the sleeve of a stereo or TRS jack cable. Channel two, meanwhile, has 48V phantom power for mics or other sources that require it. The MM200 features a global tone switch - called 'colour' and a super-simplistic approach to EQ: no parametric mid option (no middle control at all on channel two, in fact), and as regular users of the Compact 60 3, we'll say that it's testament to AER's design that we rarely find a need for it. Now, if you've heard Monte Montgomery play, you might be surprised that he finds no need for a feedback-busting section, phase switches or any other extra features on his AER. The man plays loud - one of the reasons the MM200 is so heffing powerful - often with extra effects and overdrive in his sound (albeit through an additional electric guitar amp). There's also an effects section, headphone socket, auxiliary input, tuner out, line out and effects loop, and of course the all-important XLR DI outputs. Finally, there's a mute switch available, but Montgomery requested that it be footswitchable, so you get a top-panel mounted jack where a switch can be connected. There is not one included. In an effort to get as wide a sample as possible, we tried systems including the Taylor ES, Fishman F1 Aura+, K&K Pure Mini and Fishman Rare Earth Blend. "The majority of guitars just sound good plugged straight in with minimum fuss"
The Taylor has a bit of a nasal envelope, which throws up a few issues. The controls do offer more flexibility than they might suggest; but the Taylor, especially, is left wanting. The majority of guitars just sound good plugged straight in with minimum fuss, however, and switching to the far more ubiquitous Fishman under-saddle and blend systems is less of a challenge. Volume-wise, the AER's colossal lungs keep on shouting way past acceptable levels, and they do so with the kind of musically dynamic interaction with your guitar that cheaper amps cannot match. The AER's sonic integrity shines even at near-deafening volumes, if indeed your guitar isn't howling at that point. Montgomery's often does, and it's something he uses to brilliant effect. The pricey AER MM200 is a professional-grade powerhouse, suited to concert stages, and of course the specific needs of Monte Montgomery. To us, it feels like a Compact 60 3 on steroids, and what it might lack in EQ tweakability it more than makes up for in immense sonic integrity, dynamics and delivery at pretty much any volume level you can stand. Professional? Yup.